Apple is warning developers that a new "notarization" is required for apps distributed outside the App Store. How does a Java project comply? Browsing to this shows some useful information! Shim a sign step into the build process for the following and then resubmit for notarization. @bberenz any idea how we'd be able to shim a signing step against the above binaries into the ant build process? I assume it would be somewhere around here: https://github.com/qzind/tray/blob/2.0/build.xml#L28 in the build chain. I can handle the signing code, I'm just not sure how to gain access to these libraries after compilation and before packaging (e.g. extract and loop over *.dylib|*.jnilib). We still code-sign qz-tray.jar so it must occur prior to that step. This is apple-only (currently) so I'm ok if we need to issue a shell command to do this, but ANT is preferred for obvious reasons. @bberenz some proof of concept code... I'll need help expanding this to all .jnilib and .dylib files found inside the above locations. 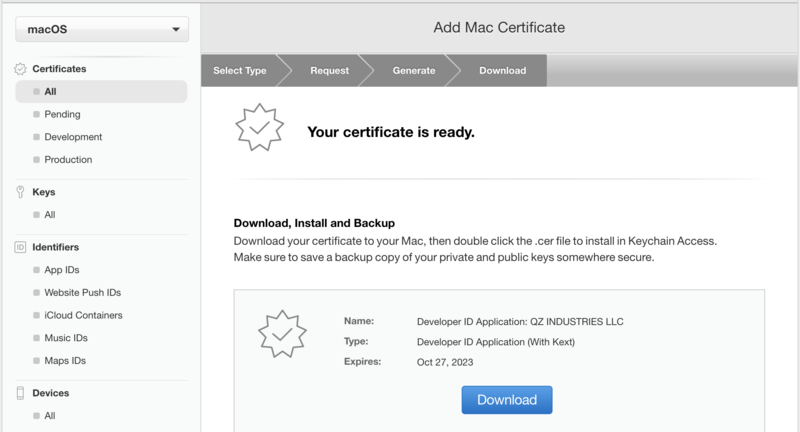 Note, our current certificate isn't marked for code signing, so I had to obtain one from Apple using our Developer account in order for this to work. This new code-signing cert must be placed in the code repo as part of the (eventual) PR. Probably not the prettiest code since we can't iterate over files with ant, but this avoids having to script the process. The only line I am not sure about working right is build.xml#L409, the man page for codesign says it accepts multiple paths, but provides no example of how, so ant's format may be incorrect. This is currently only a problem for one of the jars which contains multiple .jnilib files in it (jssc). Space delimited appears to be the accepted technique but I still don't think it's legal. When exec runs it passes each parameter in as a single string, so you need some way to dynamically <arg value="..."/> based on the number of files. Ant might have some type of support for this. The ant mailing list seems to suggest it does. Yeah, iteration is a huge gap with this build system it appears. For now I've committed some platform-dependent working xarg code by invoking bash -c in da0da72 directly and assumes files are always colon-delimited. This makes it even uglier, but has the benefit of calling codesign once per file, which might be a bit easier to troubleshoot if a problem occurs. @bberenz I'll defer to you whether or not I can make use of multiple arguments. I think all that's left is to bundle these dependencies back into the jar, right? Then I can submit for notarization. HTTPS doesn't work for me with this latest commit. There are some other anomalies that occur, but this is the most notable. HTTPS fixed via 1e4be13. Travis is broken because we're attempting to codesign on machines without signing support. Fixed the HTTPS issue and submitted the app for notarization. Apple has successfully notarized the app. Just need to fix Travis and the signing branch is good to merge.